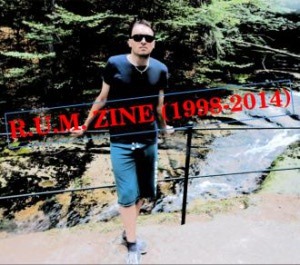 RUMzine is magazine about (mostly) metal and -core music, gothic and EBM bands, live shows and whatever you can imagine to have something to do with metal scene. You can find here album reviews, stories, inteviews with the bands, live show reports, promo stuff from the bands, few lyrics and also some band-contacts. Who is behind R.U.M. ZINE and how long has RUMzine been there? R.U. M. ZINE was established in 1998 when two friends ALLeš and MarduK decided to make own fan zine about metal bands and stuff, mostly oriented to Czech Republic, Slovakia, central and eastern Europe. On May 1999 first few reviews were written by Gory (Issue 3), who was also working on building the internet version of originally copier-printed paper magazine. Internet version was initiated somewhen in 2001, and then R.U.M. ZINE was produced in two forms – as paper zine and as the web.. During 2002-2003 MarduK is busy with other things, the time is changing also, printed version is becoming little out, so remaining guys hang up printed version and produce internet version only. This time, ALLeš is joining well known PAYO magazine as a regular member of editorial staff, since May 2006 also Gory has been included as a correspondent. Later in 2006, Radim joins the RUM team. On February 2007, internet version is out of order for a while because of deletion on the original server. It was our fault, we exceeded provided space severalfold, so the provider solved it by deletion/disconnection.. Finally on March 2007, the new domain is there, it is 100% legal and we have enough space to be there for at least few next years… And now we have two version of R.U.M. ZINE. CZ and english version. Why you have chosen the name R.U.M.zine? Originally it did mean Renaissance Underground Music, and the similiarity with alcoholic drink (in the Czech Republic, there is RUM little bit different kind of alcohol then it is known over the world, and it is popular here also its funny way) was also important circumstance. We used it with dots between the letters so it was R.U.M. zine. Is the zine itself the only activity under the mark RUMzine? Nope. In 2003, R.U.M. zine released compilation CD-R called “The first Czechoslovak CD-Liquor” in about 300 copies (actually sold out), featuring bands like PERVERSIST, RHODIAN, MORGAIN, SPUTNIK, SECTOR-X and other. CD also contains multimedial track with all the stuff released on RUMzine to 2003 and few bonuses like photos and mp3s. Next activity under R.U.M. zine mark was live show RUM Party in 2004 and then in friendly cooperation with PigeonShitAgency there was 10 concerts organized as PigeonShitRum Party at PonorkaMusicPub in Kralupy nad Vltavou, from where it can be told that we are, during 2004-2006. ALLeš is a editor of PAŘAT magazine (the biggest printed metal magazine of Czech republic) and he supports metal bands on radio show “Hard And Heavy (radio BEAT – Prag, Czech republic). Could I help you, could you help me or could I just contact you?